This clinical experience has evolved into the Watson Headache Approach which I have now taught nationally and internationally for the past 25 years. My courses are primarily for those in the manual therapy professions but also include medical doctors who have additional qualifications in the musculoskeletal area. The biggest problem is the perspective of the medical model of headache (and consequently what we are taught) i.e., that cervical dysfunction cannot be a causal factor in primary headache – so our beliefs get in the way i.e., as manual therapists we can only treat cervicogenic headache – this defies elementary neuro anatomy and shows the ignorance of the medical model of headache. Secondly, how many of us as new graduates had comprehensive knowledge of and were confident palpating the upper cervical spine, and please, please…. do not ask me to assess the stability of the upper cervical spine – stability testing is not even taught in undergraduate programs anymore! So without these skills what chance do we have of not only finding and determining the relevancy of upper cervical dysfunction to primary headache, let alone managing it successfully? How likely then is it that we are going to be successful(?) and then what happens? ‘Yellow Flags’ or ‘central sensitisation’ or ‘chronicity’ are blamed. This is a disservice to those afflicted by headache and migraine. We need to think critically and take a hard, long look at ourselves and recognize that maybe, just maybe… unsuccessful outcomes are a result of OUR lack of skill (as manual therapists) and misconceptions. Once you start consulting those with headache and migraine with advanced skills, and a liberal, common sense perspective, outcomes will change and your paradigm will shift enormously. So, if you believe that we can only treat cervicogenic headache you are not up-to-date with contemporary research. You are accepting what you have been taught at face value. You are neglecting a very, very large group of patients. Headache and migraine is one of the most, if not, the most common ailment known to humankind. Then download my complimentary guide “10 Misconceptions When Treating Headache and Migraine” which will give you my insights based on 22000 hours of experience. Developing advanced skills in treating headache and migraine means superior outcomes for your patients. You now what this means. You will be run off your feet and your general clinic will quickly be transformed into a headache clinic! why focusing on ‘Yellow Flags’ initially is exactly what we should not be doing – watch them disappear when symptoms improve! why the belief that reproduction of headache when examining the upper cervical structures is inappropriate… is to be avoided, is wrong… it is crucial! why the assumption that cervicogenic headache is side-locked i.e., it does not alternate or swap sides is incorrect, in fact alternating headache or headache with side-shift IS a cervicogenic headache. Thank you for listening, I’m Dean Watson and I look forward to working with you. Dean Watson on behalf of the Watson Headache® Institute trains Manual Therapists (Physiotherapists, Chiropractors, Osteopaths and Manual Therapy Doctors) in the internationally acclaimed Watson Headache® Approach. The Watson Headache® Approach is the only scientifically validated manual cervical approach which has been show to affect the underlying cause of headache and migraine conditions. Gain the skills, knowledge and experience to transform lives by eliminating headache and migraine. The most recent Level 1 Course filled with 87.5% who had heard about us by word of mouth. Courses consistently receive feedback with 88.9% participants scoring a 9 or 10 to indicate they would recommend our courses. Thank you to those of you who have. This helps to fulfill Dean Watson’s vision that “every headache sufferer will routinely have access to a skilled assessment of the upper cervical spine”. Determine the relevancy of upper cervical afferents to headache and migraine – With 390 million migraine sufferers worldwide, clinical experience and scientific validation has proven that identifying cervical relevancy is a skill set needed to treat more than just ‘cervicogenic headache’. Identify the cause of headache and migraine – With specific techniques and associated clinical reasoning you will be able to precisely determine which segment/s are involved in headache and migraine thereby removing the guesswork out of treatment. Utilizing this systematic approach achieves superior clinical outcomes – With this new skill you can change lives; you’ll be inundated with patients that are searching for headache or migraine relief – Say goodbye to general practice. Please Note: The Watson Headache® Institute courses are only open to those holding a Tertiary Qualification in, and Professional Registration to practice as a Physiotherapist, Chiropractor, Osteopath or a Manual Therapy Doctor. This may differ depending on the host's country. Professional Registration to practice as a Physiotherapist, Chiropractor, Osteopath or a Manual Therapy Doctor. Silea and Rome with Italian Translation. Professional Registration to practice as a Physiotherapist. Professional Registration to practice as a Physiotherapist or Osteopath. What’s Included in Our Professional Education Courses? Be prepared for a paradigm shift! 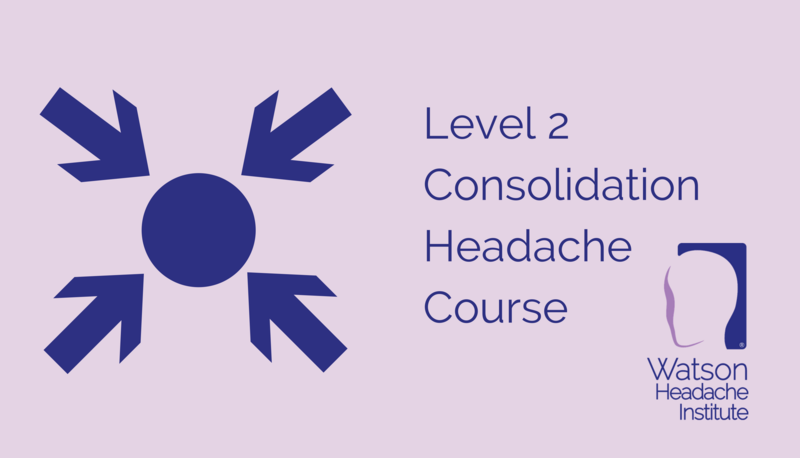 This three day, highly practical course will not only change your perspective of the role of cervicogenic dysfunction in primary headache, but also takes the guesswork out of treating the headache and migraine condition – no headache or migraine is complicated. 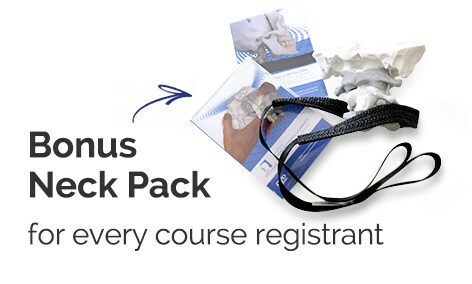 Please Note: We can only supply the bonus Neck Model Pack on courses presented in Australia. You’ll learn the ʻWatson Headache Approachʼ – a scientifically validated (Dean will share the result of his ground breaking PhD research – some are saying this is the most significant research in manual therapy and headache for decades) method of confirming cervicogenic dysfunction as the source of sensitisation of the brainstem the disorder that underpins many primary headache syndromes. 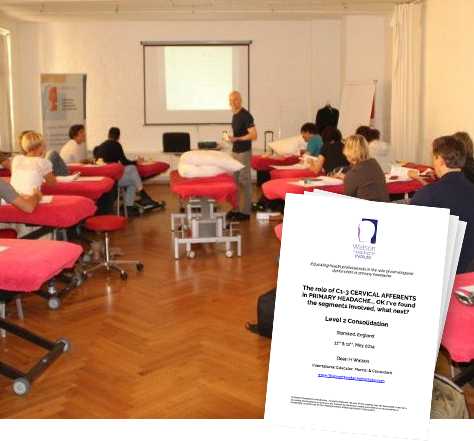 Deanʼs manual therapy approach challenges – asks questions of the sensitised brainstem. The segment/s are involved – the ʻWatson Headache Diagnosis Treatmentʼ approach enables localisation to specific segments – this diagnostic accuracy is unparalleled in manual therapy and learn alternative (to HVVTs) techniques to address upper cervical segmental hypomobility. To promote comprehensive discussion and interaction Level 2 Courses intentionally involve small groups of delegates – this takes full advantage of Dean’s unparalleled experience. Whilst on Level 1 we learnt to ‘touch’ (excuse the pun!) type, Level 2 is about becoming an ‘author’ i.e., whilst anyone can learn a technique (Level 1 Foundation)… success depends on how you use them, aka …‘CLINICAL REASONING’. Apart from the first 2-3 hours where we re-visit aspects of Level 1 and where questions from Level 1 and your experiences with patients since are addressed, my role is to facilitate and accelerate your progress… this is done through your participation in the examination of 4-6 patients. Be able to identify why progress is not as it should be Get increased confidence in your choice of treatment direction and technique – no more uncertainty Get increased clarity around un-resolving (as the technique is sustained) headache and how you can still achieve a positive result even though headache reproduction remains unchanged understand why, in the event of an adverse reaction, it occurred and … how to deal with it! 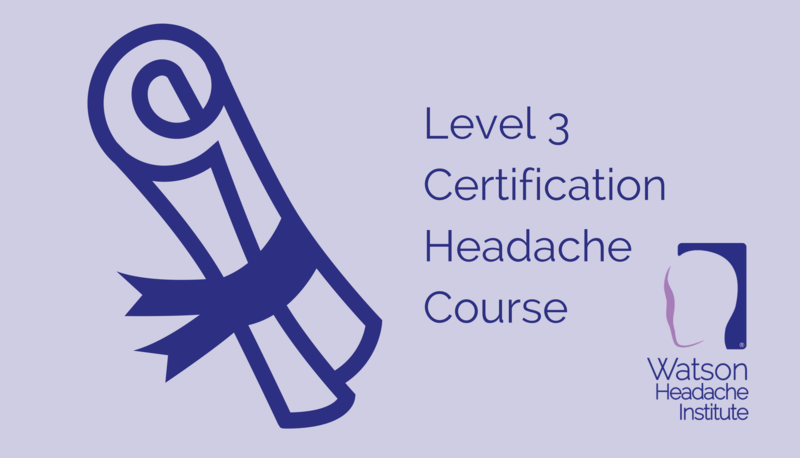 Completing the ‘Watson Headache Certified Practitioner’ Level 3 course… formal recognition of competency in the inimitable Watson Headache Approach which demonstrates to employers, professional colleagues, and those affected by headache and migraine conditions, that you have achieved the professional standard for practicing the Watson Headache Approach, and qualifies you to join an international register of colleagues who have demonstrated competency in the Watson Headache Approach. Upon completion of the Course a practitioner should be able to care for routine and complex headache patients of all types and should be competent in the physical techniques, clinical reasoning and patient communication (education and counselling). 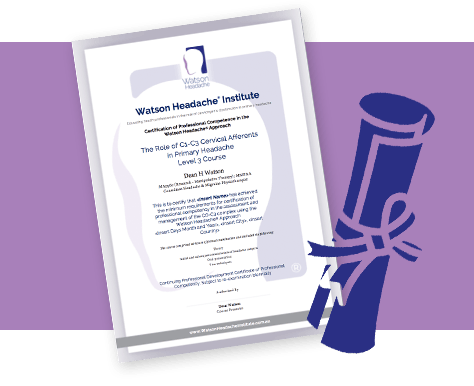 Ongoing recognition of Watson Headache Certified Practitioner qualification is conditional on maintaining the Watson Headache Approach standards, including pursuant to any re-certification by the Institute as well as retaining such professional qualifications in good standing in his or her profession, and compliance with the Institute’s policies and procedures. If after you have experienced the first day of our course and you are not 100% happy, for whatever reason, we will refund your fee. We are more than comfortable making this guarantee because of the feedback we get from participants. 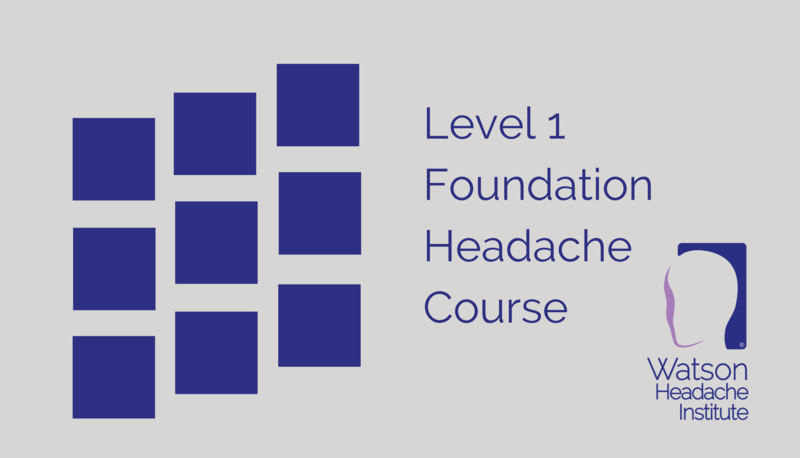 We know the Watson Headache Institute’s courses will change your perspective on the headache and migraine condition and how you manage the upper cervical spine. You may be a little anxious about the value of your first course with us. We understand this and trust this takes the risk out of your decision. Join Dean Watson and the Watson Headache Institute’s mission that every person experiencing headache or migraine routinely has access to a skilful assessment of the upper cervical spine.